Buying a good pair of walking shoes can be a somewhat daunting task because of a wide variety of footwear currently being sold on the market. What’s more challenging is that not only will you need to consider functionality and practicality, but also comfort and support when looking for the best walking shoes for women. The first step in buying any shoe should be determining what its intended use will be since this will significantly influence many of the features of the shoes that would be right for you. This guide will take you through some of the best shoes for women by looking at their key features as well as potential pros and cons. We will also give you a better understanding of what you should be looking for in the ideal walking shoes. The TIOSEBON Women’s Athletic Shoes made it into our top five as it’s an incredibly well-made product with some great features at an affordable price. The TIOSEBON uses a mesh design, making it extremely lightweight and breathable. This also has a sleek and compact design that won’t feel clunky or as if it was weighing you down during long walks. This also makes the shoes extremely flexible, so they’re able to move in the direction of your foot comfortably. Its elasticated collar allows for the shoes to be comfortably slipped on without the risk of grinding your feet or toes against the top line. This stylish approach to the shoe fastening is becoming very popular and drastically increases the convenience of the walking shoes. The shoe itself is also curved as opposed to the more common and flatter looking shoes. This aids the walking motion and allows you to walk with greater ease. Available in 17 different colors, the TIOSEBON is a great everyday pair of shoes that can be matched to a variety of occasions and styles. Its casual look really lends itself to both everyday and sports styled footwear. Additionally, its solute midsole helps keep the shoe light but more importantly offers fantastic bounce-back, as well as shock absorption. Such features help keep unnecessary pressure off your joints, allowing you to walk further with a greater degree of comfort. Color options: The variety of color options makes the TIOSEBON appeal to a broader audience as buyers can match their shoes to their style or even buy multiple shoes for a variety of outfit choices. The material used: The breathability of the shoe is absolutely incredible as the majority of its construction is made from a mesh material, allowing for enhanced airflow keeping your feet cooler and dryer. Unique liner: Its ComforDry sock liner provides an extra layer of cushioning as well as aids in keeping your insole dry even on those hot and sweaty days or during long walks. Portable: Having a compact shoe such as the TIOSEBON is great if you need to take spare shoes with you on a trip. Their extreme flexibility also helps with this as they’re incredibly easy to store. Support and padding: There is both very little ankle support as well as almost zero padding around the collar of the shoes. This is troublesome for the fact that there is a higher risk of you spraining an ankle and the shoe will feel loose around your heel, making for an uncomfortable walking experience. Elastic collar: The elastic collar is extremely convenient for those looking to get their shoes on quickly and easily, but this will eventually loosen or break, leaving you with a pair of shoes that no longer stay on your feet. Skechers is a highly reputable shoe manufacturer and was bound to make the list. The Performance Go Walk is stylish, comfortable, and is extremely well made. The Skechers Go Walk is constructed using two materials: fabric for the body and synthetic for the sole. The fabric helps keep your feet cool as well as boosts comfort whereas the synthetic sole aids in providing stability and shock absorption. Buyers should also take note of the tread on the sole as the numerous textured points help to add greater traction, which is really helpful when traveling across slippery or uneven surfaces. Additionally, the significant curvature of the shoes provides aid in walking, making the heel-to-toe stepping motion more of a fluid movement. This helps to spread the pressure throughout your entire feet rather than just the balls of your feet. 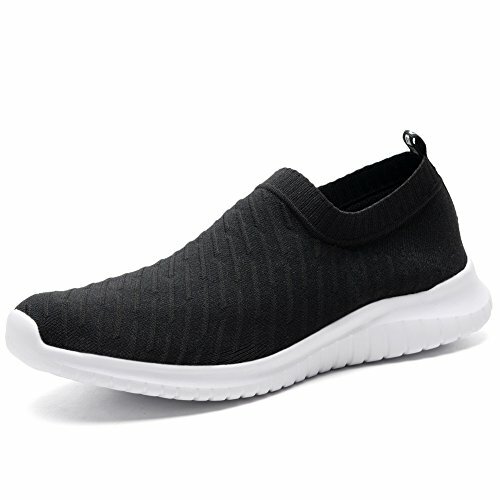 The slip-on style also makes this incredibly convenient and great everyday walking shoes that buyers can quickly put on in a fraction of the time that it takes when compared to laced or hook-and-loop shoes. Go Walk also comes in a vast variety of colors, allowing buyers to find a pair that suits their sense of style or multiple pairs for a selection of occasions. Using a Resalyte cushioning system, the shoes are not only comfortable to wear, but they are also extremely lightweight, making them suitable to wear for longer periods of times without the user feeling uneasy. Similarly, with an Ortholite insole, sweat odor won’t be retained. Design: The stylish and casual design looks great and completely different to the conventional walking shoes. That helps make the shoe applicable to a wider variety of occasions while still offering fantastic walking benefits. Special cushioning: The midsole Resalyte cushioning helps increase shock absorption which in turn reduces the impact on your joints, allowing you to walk for longer periods of time without developing any aches or pains. Synthetic material: The most common points for scuffs and holes are on the tips of the shoes. Since the Go Walk is made of a synthetic material rather than continuing with the fabric, the shoes would be usable for a longer period. Pull tab: Having a pull tab on the back of the shoe is extremely important in the overall convenience of a slip-on shoe. It also helps prevent your finger from getting caught or your foot grinding against the collar to get in. Ankle support: There is an extremely low-level of ankle support that leaves the user more prone to sprained ankles. Padding: There is a subsequent lack of padding around the collar and tongue. That does let the shoe keep its sleek profile but also makes it significantly less comfortable and will feel less secure when on your foot as compared to other shoe styles. Heel thickness: While the thickness of the heel offers a reasonable amount of shock absorption, it still can’t compete with the thicker heels often found on walking shoes that take on more of a sports style. The fabric won’t fare well in poor weather conditions. The Rykä Devo Plus 2 is an excellent option for those looking for practicality over style as it delivers a range of fantastic walking shoe features ranging from waterproofing to good ankle support. The first noticeable difference when comparing the Devo Plus 2 to the other shoes that have appeared in our list so far is the sports style. This provides a great deal more ankle support due to the higher collar as well as the sufficient padding in both the collar and the tongue. The Devo Plus 2 also has a thicker heel, allowing for a higher level of shock absorption and a generally more comfortable walk. Laced shoes like this product also benefit from more structure that allows them to keep their shape longer as well as enables the laces to be replaced if they become damaged as opposed to slip-on shoes wherein if the collar becomes loose, the entire shoes become useless. Despite getting more from this pair of shoes, it remains incredibly lightweight at only 8.3 ounces due to its mesh and synthetic construction. This helps it retain some of its flexibility as well as ensures the users that walking for longer periods of time won’t give them the feeling that their shoes are hindering them. With a footbed designed with a focus on pressure points combined with a Rezorb platform, there is greater cushioning on the bottom of your feet for greater comfort. Ankle support: The increased ankle support is a huge plus when you’re looking for a walking shoe that can cope with a greater variety of terrain. Laced design: Being designed in a sports style also allows room for additional padding not only to increase the user’s comfort but also create a better and more secure fit. This secure feeling is also aided by the laced design as users can appropriately adjust the tightness of the shoe. Color choices: There is a good level of color options available, allowing the users to select a shoe that best matches their personality. Tread: The Devo Plus 2’s tread is focused around your natural pressure points, allowing for greater traction and stability when crossing slippery or uneven terrain. Vibrant colors: Although the styling makes for a very practical walking shoe, it doesn’t allow the shoe to suit a variety of occasions as the color choices are a lot more vibrant and the shoe itself is relatively large compared to some other options that are available. Lace placement: The laces don’t pass through the body of the shoe but instead through tabs on the top of the shoe. These tabs are more prone to breaking, and users won’t be able to replace them, so they’ll be left with loose or useless walking shoes. New Balance is a world-renowned footwear manufacturer, and the WW577 is another testament to their quality craftsmanship. The leather construction of this pair of shoes increases its level of water resistance as well as produces more durable and longer-lasting footwear. It also has air holes place in targeted positions to maximize the exchange of air throughout the shoes. The WW577’s padded tongue and collar deliver a secure and comfortable fit for the user while the shaft has a low-top measurement from the arch. Being a laced pair of shoes, it will also increase the overall fit as users are able to adjust the tightness of the shoes across their feet to a comfortable level without any hassles. With Abzorb technology in the midsole cushioning, users will feel a lot less pressure in both their feet and joints when wearing the New Balance WW577’s. With this pressure alleviated, wearers can enjoy longer or more strenuous walks without worrying about uncomfortable aches and pains. Additionally, since it is integrated with an elasticated, Strike Path rubber sole, the shoes can slightly expand upon impact with the ground; therefore, improving the level of stability in each step as opposed to more rigid outer soles found on similar shoes. Cost-efficiency: The quality of construction coupled with an affordable price makes the WW577 a hard deal to turn away from. Its leather body provides increased durability as well as waterproofing, delivering a shoe that’ll last through years of wear and tear. Unique cushion: Utilizing Abzorb technology in the midsole, as opposed to more general cushioning technology, this pair can be easily set apart from others. Buyers who are looking forward to using the shoes in impact-heavy situations will be happy with this pair. Proper padding distribution: Wearers of the WW577 will also really appreciate the extra level of comfort produced by the high amount of padding precisely placed around the key pressure points within the shoes. This also provides a better fit in general as your feet will feel more snug and secure. Color and design: Buyers are very limited in their choice of colors, and the style of the shoe itself isn’t the most exciting design. Weight: As with most leather shoes, the WW577 can feel relatively heavy after walking for longer periods of time. Despite being extremely comfortable, they can begin to feel quite large on your feet. Flat tread: The tread along the bottom of the outer sole seems relatively flat as opposed to similar shoes that feature numerous points of impact with textured surfaces. This makes the shoe less stable on slippery surfaces. The KONHILL athletic slip-on shoe offers convenience, style, and functionality in a compact and affordable package. 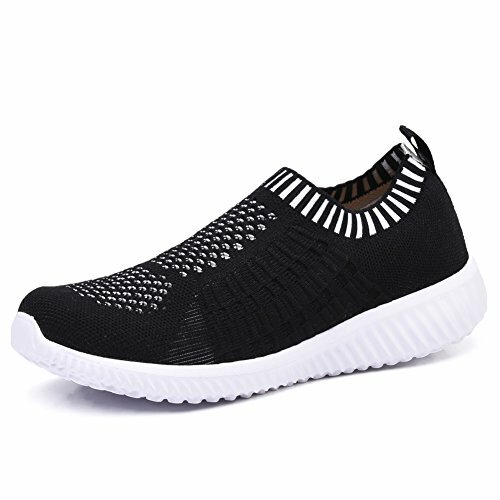 With the body being made of a textured material, users get the breathability found in mesh shoes and the comfort and protection associated with fabric shoes. This also provides a unique style for buyers who want walking shoes that stand out from the rest. The KONHILL athletic shoes also have a quite thick heel and midsole when compared to shoes of a similar level. This is great for shock absorption, which means your joints and feet don’t suffer as much from each impact, making the KONHILL an excellent pair of shoes for exercise as well as everyday wear. With the sole being made from elasticated rubber, the base will expand on impact to provide an exceptional level of stability with each step. These slip-on shoes also have a conveniently located pull tab on the heel for even easier access as you no longer need to worry about catching your fingers against the collar. Buyers also have a massive selection of 20 different colors, allowing them to select a pair that best matches their personal style. Flexibility: The pair of shoes is extremely flexible, meaning it bends and moves with your foot freely, producing a more natural and comfortable feel when walking. Good value for money: The textured material used in its construction creates a high-quality look and feel for an incredibly affordable price. Ease of use: As with all slip-on shoes, the KONHILL athletic shoes are extremely quick and easy to put on, making them the most convenient choice for everyday footwear. They’re also significantly more manageable to wear than shoes with lace-ups or hook-and-loop fastening systems. Color options: The choice in color is a huge plus and style can be just as outstanding as function when looking for shoes that you’ll be wearing on a regular basis. Padding: There is a real lack of padding around the collar, so it does not provide the most secure fit available, making the shoe feel loose during more intense activities such as running. Collar: Using an elasticated collar is great for convenience, but over time will begin to loosen, leaving the buyer with an ill-fitting shoe that may even become unusable. Waterproofing: Due to its construction and style, the KONHILL isn’t the best shoe when it comes to practical use during a variety of weather conditions. It’s low-level of waterproofing could prove to be an uncomfortable nuisance during those winter and rainy months. Buying a good pair of walking shoes isn’t anywhere near as easy as it used to be since there are so many different options available today. Your primary focus then should be on comfort and intended use, as you don’t want a pair that doesn’t adequately serve your needs. This buyer’s guide will look at some of the things you should look out for when buying your walking shoes. Type of use is perhaps the most crucial aspect to consider since buying a functional pair of shoes is far more important than purchasing one that simply looks good. So, first, determine where you intend to use the shoes, whether it’ll be everyday use, casual weekend use, running, gym use or for work. That will help you establish which shoes are most appropriate, and then start looking at the different features they offer so that you can compare them to other shoes that are available. For example, runners will want sports styled shoes with a significant amount of cushioning in the midsole for shock absorption as well as a slight curve on the heel and tip of the shoe for increased ease of movement. Casual weekend shoe enthusiasts, on the other hand, may consider style and convenience over worrying about the level of impact on the joints as they don’t plan on partaking in any strenuous activities. For those who are unsure what pronation is, it refers to the way your foot rolls inward for impact distribution upon landing. Knowing your pronation type can go a long way in helping you find the optimal fit for you. Underpronators are better suited for shoes with large amounts of cushioning to reduce the impact force and risk of injury. Overpronators should look for shoes that offer more structured and supportive cushioning not only to reduce impact but also keep their foot in a better landing position. Neutral pronators can wear a more extensive variety of shoes as their feet deal with impacts better than others. The length of your shoe should be large enough to accommodate your foot when it impacts the ground and needs more room to move and expand. However, make sure that it is not too long that it becomes difficult to walk in it. You should typically aim to be able to fit the width of your thumb between the tips of your toes and the end of the shoe. The most important thing is that your feet feel comfortable in the shoes and you’ll easily able to wiggle your toes without any discomfort. The width of the shoe is significant as this is what creates the feeling of a snug and secure fit. A pair of shoes that is too wide will shake around while moving, leaving you more likely to sprain an ankle than a correctly fitting shoe. On the other hand, shoes that are too tight will just be unbearable to walk in as you’ll be in constant distress especially with each impact when your feet land on the ground. When finding a shoe with the right width, you also want to take a proper look at the level of padding as this varies from shoe to shoe and typically doesn’t influence the shoe width size. Yes, the padding will eventually loosen and become more comfortable, but it can slightly be irritating, to begin with. That is why it’s good to try a variety of shoes before making a final purchase. When buying a shoe, always check the weight, so it’s better if you can get a feel for it and try it on. Shoes that are made of leather are generally more durable and put up with more physical activities; however, they’re commonly a lot heavier than shoes made of mesh materials. That can lead them to feel clunky and uncomfortable when wearing them for long periods of time, so this type of shoes also doesn’t lend itself to activities like running. Lighter mesh and fabric shoes have a higher level of breathability, which is great when you’re continually moving, or during summer months. These will keep your feet cooler and dryer while also not leaving you with the feeling that they weigh you down. Getting the right fit is above all else your number one priority since an ill-fitting shoe will not only fail to fulfill its intended use but also feel uncomfortable throughout the entire process. You’ll also be more likely to have accidents on uneven or slippery terrain as you’ll have difficulty stabilizing yourself. Again, the only way to know what fit is right for you is to try on a bunch of different shoe types and take note of the ones that feel most comfortable for you. You can then use this to find the right shoes that tick all your boxes. 1. What makes shoes squeak when walking? The squeak in a shoe is often the result of moisture getting trapped between the insert and the midsole. This is more likely to occur in shoes with ill-fitting inserts or ones with material that’s not very fast drying as well as shoes with low breathability. There is a simple fix though; you just need to find an insert that correctly matches the size of your shoes. 2. What are walking shoes? 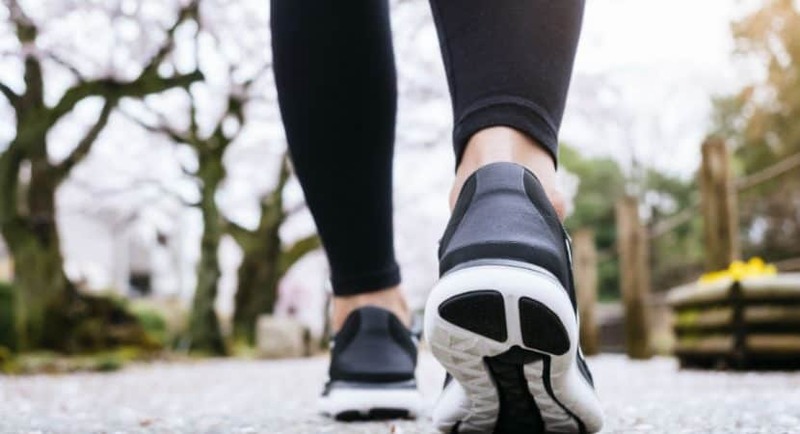 Walking shoes are shoes that are designed to lessen the impact on your joints when your foot lands on the ground as well as providing a comfortable and secure fit, typically with larger amounts of padding around the collar and throughout the tongue. 3. 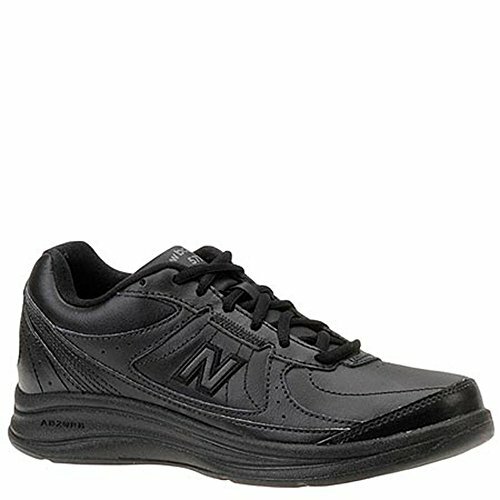 Why do my shoes make noise when I walk? If it is a squeaking sound, then it is most likely moisture trapped between the insert and the midsole of the shoes. On the contrary, if it is a deeper rubbing sound, then it could be that the shock absorption in the midsole is torn and when your foot presses on the heel, it causes these broken compartments to rub together. You can test for that by seeing how much the heel depresses when pressure is applied. If you can depress it with ease more than five millimeters, chances are it’s torn. This rarely occurs and only happens after extremely heavy and intensive use. 4. How should walking shoes fit? Walking shoes should provide a snug fit around the entirety of your foot with a greater focus around your heel and ankle. If the shoe is too loose, you’ll lose a great deal of stability, and you’ll be left more prone to accidents. Hence, always make sure that your shoes are securely fastened and positioned correctly to avoid this. To get the right-fitting shoe, head down to your local store and try a variety on until you find a good fit. 5. How to lace walking shoes? There are a variety of methods to lacing shoes, but the most commonly accepted way is with the criss-cross pattern. This provides the highest level of security across the entire structure of the shoes. Most shoes come laced this way for you, but if not, you simply start from the bottom of the tongue and apply an over-and-under technique. Now that you’ve had a thorough read through our review, you should have a better understanding of what features are available and which ones would best suit your needs. 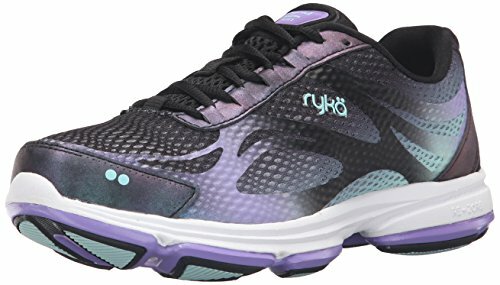 Our recommendation based on our best walking shoes for women review is the Rykä Devo Plus 2. Not only does this pair of shoes provides the highest level of ankle support but it also offers an exceptional level of padding for a secure fit, as well as excellent breathability through its synthetic construction, and has a lace-up design to fasten and achieve the best fit quickly. Lastly, with all those features, it is available at an incredibly affordable price, especially when compared to shoes offering a similar level of functionality.